Santa Fe: Multiple people were killed on Friday in a shooting at a high school in Santa Fe, Texas, a law enforcement source said, in the latest gun violence in a country still shaken by the massacre at a Florida high school in February. 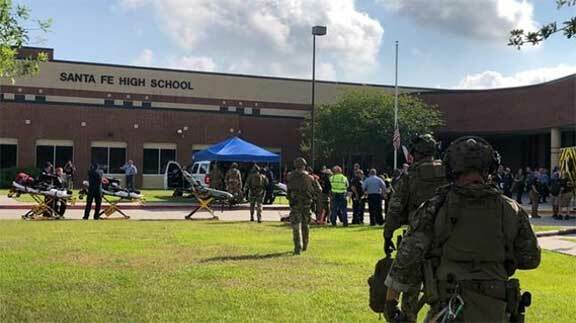 The law enforcement source said the suspected shooter was in custody after the attack at the school about 30 miles (48 km) southeast of Houston. Local media reported at least eight people were killed. “This is no longer an active shooting situation and the injured are being treated,” the sheriff’s department said on Twitter. Harris County Sheriff Ed Gonzalez said on Twitter that one person was in custody and a second was detained. “An injured police officer is being treated, the extent of his injuries are unknown,” Gonzalez said. Dr. David Marshall, chief nursing officer at the University of Texas Medical Branch, said that the hospital was treating at least three patients – two adults and one person under 18. He said it was not immediately clear if that child was a student. In February, Santa Fe High School was placed on lockdown while police investigated a “popping sound” that was feared to be gunshots, but no threat was found, the school district said. hen on Wednesday a police officer assigned to an Illinois high school shot and wounded a 19-year-old former student who had brought a gun to the school, authorities said.